We have been printing consistently with Web Offset for more than nine years and time and time again, their team has gone above and beyond to make sure that are newspapers are printed on time, as promised and delivered without delay. I would not hesitate to recommend them for any commercial printing needs and know that the team will take the same amount of care with every customer. - Marie G.
WebOffset Printing is a family owned and operated printing company in the heart of Clearwater, Florida. We have been doing business in the web offset printing industry since 1994 when our doors first opened. Magazines, weekly newspapers, catalogs and advertising inserts are our specialty. At WebOffset Printing our repeat customers are a testament to our superior customer service and quality, on-time printing. Visit our testimonial page to see some of the wonderful things our customers have to say about WebOffset. Advertisers and publishers seek the highest quality and flexibility available. Web Offset’s presses are equipped with the newest computer controlled devices offered today. Our color control and register systems are designed to scan the sheet as it runs and make any corrections necessary. This ensures our customers the most consistent printing possible from the first copy to the last. 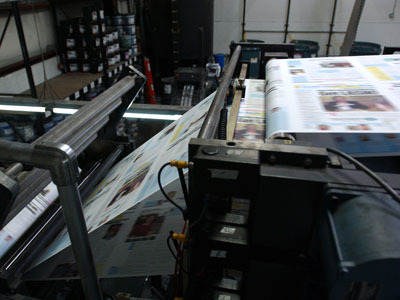 We can run many press configurations, including standards, tabloids, magazines, books, calendars, digests or coupon books. WebOffset also offers a wide array of finishing options providing a professional look to all of your printing projects. WebOffset offers one-stop mailing service if you want to mail publications that you have had printed. One stop-mailing will save you time and everyone knows that time is money. WebOffset is committed to preserving the environment. Our recycling, ink choices and recycled paper are just a few examples of our commitment to lessening our environmental footprint. Learn more about our environmentally safe printing practices.